She did, see above, then pointed me to this intriguing Food Lab article on aged eggnog: http://www.seriouseats.com/2016/09/is-aging-holiday-eggnog-worth-it.html. It seems intuitive to me that the longer anything ages, the more complex and funky it will be. But is it better? That was the case with two-year eggnog, which had turned a kind of dangerous-looking brown, but I enjoyed the deep funk. How can you keep dairy and eggs in your fridge for a year or three? The alcohol kills the bacteria that cause food to spoil (not to mention salmonella that might be in raw egg). This is a good thing to remember if you need to leave town and find you have a lot of dairy and eggs that will go bad–just ad 20 percent booze by weight and it will keep. Kenji, in his post above, says it pasturizes the liquid in 24 hours, but studies I read said it could take as long as 30 days to eliminate 100 percent of the bacteria. The Food Lab post is interesting because it presents a taste test wherein the blind tasters prefer the fresh eggnog. Less romantic but makes more intuitive sense. It also means you can make your eggnog now and enjoy it from Thanksgiving through New Years (if you make enough—it doesn’t usually last long). This recipe is pretty boozy—feel free to reduce the alcohol to 1 liter total, or to taste. I like the mix of boozes for flavor but anything goes here. If you’re feeling super-flush and want to make it very special, try using Oban single-malt, a whiskey that goes particularly well with cream, as this cocktail post, announcing a new cocktail, The Major Award, notes. If you have room in the fridge, make a double batch, and hold some back for text year to see if the aging is worth it. Serve topped with sweet meringue and nutmeg if you wish. This will make about 3 quarts of eggnog. 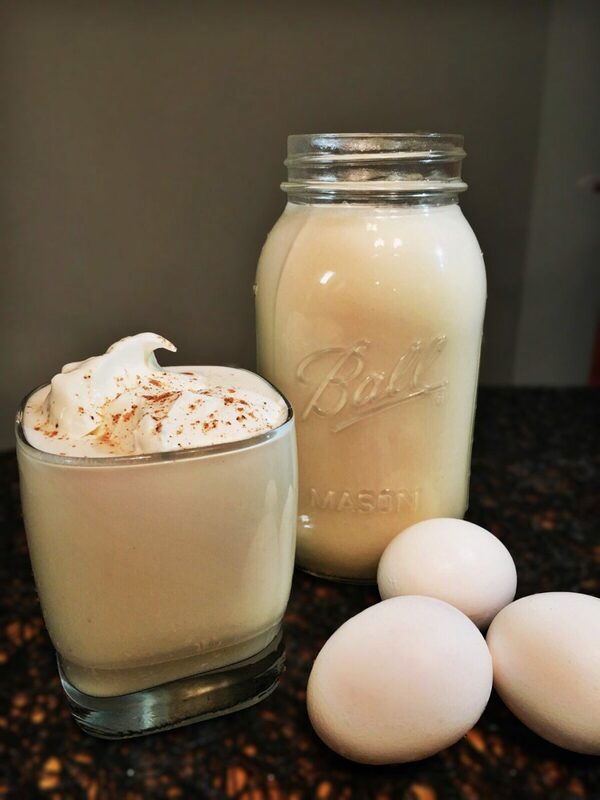 This is the best eggnog on earth! I make two batches every January and even have one 3 yr old bottle we will drink this Christmas! Thanks for the reminder. We’ll make ours this weekend. My husband and I made it last year and it was amazing. I’ll be making eggnog this weekend, pouring it into great looking bottles and storing it in my fridge until Thanksgiving. Friends can expect to take a liter home with instructions to “save” it until Christmas (maybe). I’ll even toss in the nutmeg and a picture of what the finished product looks like. Great recipe – as always, thank you for sharing Michael. We use 100 Proof Southern Comfort. That gives it a great taste. I’ve done this one as well as President Washington’s recipe. In both cases I’ve started making it sometime between Thanksgiving and Christmas and drinking it the following year. A gallon of eggnog..? How many guests do you have? Very nice photo Emilia, looks like egg whites whipped with cinnamon. Thank you! I love the original recipe, 2012, I’ve been making it for quite sometime. I made the Oban batch this year, I’ll be tapping into it early December for a fancy dinner celebration. I will let you know the outcome. Can’t remember who’s joke it is (Louis Anderson?). Eggnog; when you want to get drunk, but also want pancakes. I sort of already have a container of this wonderful stuff in my refrigerator back in Ohio….from 2014. My favorite great aunt, born in the 1880s, used to make a similar one. She beat 2 cups of sugar with a dozen eggs, and added some booze – 1 pint each of brandy and rye, and 1/2 pint of white rum. We children had to whisk while she slowly added the alcohol (whisky first). Then at the end, she added enough half and half to make up a gallon. And the nutmug grating, mostly just when you serve each glass. We usually made extra large batches! I made two batches last year. Really enjoyed the first…and it has taken a lot of self control to save the second. I am mixing this up now! Thank you! When I was a kid all eggnog came from a carton along with the tom and Jerry’s. I’m glad I can bring this to the (adult) family table. Simply the best. I have some from 2014 for a taste test, and some ready to go. The 2014 batch has a great golden color and rich taste – not really funky but sharper, deeper and more interesting than the fresh batch. I made this last night and I’ve split it into 5 mason jars. I’ve noticed that it has separated and there is a clear-ish liquid near the bottom. Should I be shaking the jars regularly or letting them sit? I have last year’s batch waiting for me…and I do have some Oban on hand. It sounds like I need to get working on next years, too! I made this last November and kept half of it to age further. I shared it during a family reunion in the summer which was dubbed our”Christmas in July”. Everyone loved how smooth and custard-like it was. There’s only a cup left that I plan on keeping until its third year. Here’s your challenge, Michael. Make it shelf stable. How can we make this and then keep it on a pantry shelf to age for a year? For those of us who have access to home raised chickens, can you convert the yolks to volume please? I get my eggs from a friend who has laying hens and the size of the eggs can vary greatly. Uh oh. Was I supposed to leave this in the fridge? I have a growler from last December sitting on the shelf in the basement. I check on it regularly and it seems to be a consistent color and texture. Thanks a lot for the reminder. We’ll make ours this weekend. My wife and I made it last year and it was amazing. Tonight I’ll fix the spicey orange chicken and tomorrow will commence on the Egg Nog. Sorry for the rough year. Transitioning too, empty nest portions for meals trade from cooking for a frat house mentality. My collection of your books & CIA’s are displayed in my kitchen’s glassed doored cabinets as they are the most revered.